This chapter furthers the conceptualizing if uber-sport through recourse to Mandel and Jameson’s understanding of late capitalism, in conjunction with Debord’s theory of the society of the spectacle. This combination leads to an exposition of the integrated uber-sport spectacle, and its various sub-spectacles, as a conceptual model for understanding the structure and working of ideological normalization within consumer capitalist societies. 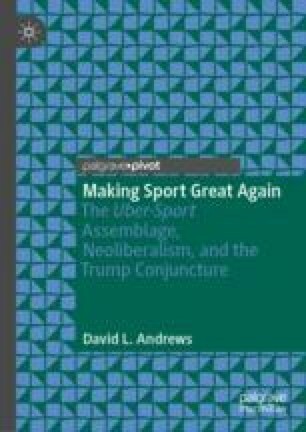 Although insightful, the notion of uber-sport as an integrated spectacle remains rather abstract, so in order to more empirically frame this analysis, the discussion turns to DeLanda’s Deleuzian-informed assemblage theory. Following an overview of the derivation and assumptions of assemblage theory, uber-sport is examined as an acentered assemblage constituted by a contingent amalgam of heterogenous elements, and complex intra- and inter-assemblage rhizomatic relations. Doidge, K. (2018, July 9). How the World Cup has renewed an emotional sense of belonging in England fans. Retrieved from https://www.britac.ac.uk/blog/how-world-cup-2018-has-renewed-emotional-sense-belonging-england-fans?utm_medium=social&utm_source=twitter&utm_campaign=worldcup2018&utm_content=other&utm_term=blog. Gray, R. (2018). Jed York, Michael Rubin Weigh-In on sports disruption. Street and Smith’s Sports Business Daily. Retrieved from https://www.sportsbusinessdaily.com/en/Daily/Issues/2018/04/19/World%20Congress%20of%20Sports/Disruptors.aspx.